HE CAME, HE SAW, BUT DID HE CONQUER? The last decade has seen something of a resurgence of interest in Roman Scotland and this paper will discuss a number of chronological issues that have arisen as a result. Since 1995, the writer’s own contribution has been through the Roman Gask Project: a long-term research program whose remit is to study Roman Scotland north of the Antonine Wall, although, as the name suggests, its principle focus has been on the system of military works on and around the Gask Ridge in Perthshire. 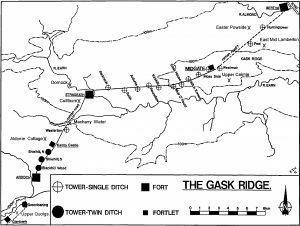 The Gask line is a fortified Roman frontier (albeit without a running barrier) and consists of a chain of turf and timber built forts, fortlets and watch towers, strung out along the Roman road to the Tay. At present, some 37 km are known, stretching from Glenbank, to the north of Dunblane, to Bertha just upstream of Perth, on the Tay (fig 1), and more probably awaits discovery. It is, however, only part of a much larger system, for there is a further series of forts to the north, along Strathmore and the southern highland fringe, whose lynchpin lies at the legionary fortress of Inchtuthil (fig 2). The entire system was probably designed to control the strategic, potential invasion corridor through Strathmore, Strathearn and Strathallan and, although the more northerly forts are often called “glen blockers”, as though their principle role was to guard against direct attacks from the Highland massif, they may have been just as useful as a means of preventing any force moving down Strathmore from outflanking the main frontier by using the maze of interconnecting passes which link Loch Lomond and the Tay, Earn and Teith valleys within the hills. The frontier may, thus, show a greater strategic appreciation than has often been realised but, at first sight, there is otherwise nothing particularly remarkable about it. It belongs to a familiar class of early Roman frontier defences which also includes the Wetterau Limes in Germany and, although good work had been done, few archaeologists had paid it much attention. It was certainly noted as the earliest Roman frontier in Britain, for there was evidence to date its construction to the Flavian period, around forty years before Hadrian’s Wall. But its attractiveness as a research target suffered partly because it was seen as less glamorous than the two wall frontiers and partly because it was thought to be slightly later than the German frontier. The 1990’s, however, saw a thorough reexamination of the dating evidence for the birth of the German Limes and it now seems to be generally accepted that it was not built until 15 – 20 years later than had been thought, in the early years of the second century, and the reign of the Emperor Trajan. This puts it later than the Gask which means that, against all expectations, Scotland’s Cinderella system can now claim to be the prototype Roman land frontier and a monument of international importance. It thus became vital that a more systematic study should take place, hence inter alia the Roman Gask Project. Interestingly, the Project’s own results have been equally unexpected, if in the opposite direction and, again, the shocks have concerned dating. The traditional chronology revolves around the activities of Britain’s most famous Roman governor: Gnaeus Julius Agricola. Agricola is well known because his son-in-law, the historian Tacitus, wrote an account of his life and as one of the few detailed sources for the history of Roman Britain, this little book has been subjected to more analysis than almost any other non religious text. Nevertheless, the gist is that Agricola took over as governor late in 77 AD and immediately began a series of military campaigns, first in North Wales and then into what is now northern England and Scotland. By 79 he had reached the Tay and then, after a few years of consolidation, he advanced further, up Strathmore and on as far as the Moray Firth. In 84 he won a decisive victory against the Caledonians at an unknown place called Mons Graupius, before being recalled to Rome by the Emperor Domitian at the end of an unusually long 7 year term of office. Tacitus then tells us, rather cryptically, in his “Histories”, that “all Britain was taken and then immediately thrown away”, suggesting that Agricola’s conquests were abandoned shortly thereafter. Not surprisingly, archaeologists have seized on this text, because it seemed to explain so much of what we find in northern Scotland. To date Scotland north of the Forth-Clyde line has yielded a frontier, a remarkable collection of over 70 temporary camps, a legionary fortress and 14 auxiliary forts, most of which seem to date to roughly this period, and with coin evidence to suggest that the area was indeed abandoned in the mid 80’s. There has been much argument over detail, but it has usually been assumed that the northernmost forts (including Inchtuthil) were built after Mons Graupius by Agricola’s, as yet unknown successor, and were thus only in use for the remaining few years of the Flavian occupation, whilst at least some of the forts to the south of the Tay might be Agricola’s own work and thus occupied rather longer. The Gask itself, has often been seen as shorter lived still, perhaps lasting for as little as a single year, partly because it was once thought unlikely that it would have coexisted with the glen blocker line and partly because, although the forts on the Gask have shown signs of two Flavian structural periods, suggesting a long enough occupation for repairs and rebuilding to become necessary, only a single period had been recognised in the towers and fortlets. This led to a number of suggestions for stages within the Flavian incursion where a short chronology Gask might be fitted, of which the most popular was that it represented a last ditch attempt to hold onto Fife, in the late 80’s, when the rest of the north was abandoned. The entire story became a model of the way in which archaeology and historical texts could be used in combination and the writer, for one, believed it implicitly. Almost immediately, however, the Gask Project began to throw unexpected doubts on the traditional chronology, because there was simply too much archaeology to fit. The Project’s work began with excavations at the three Gask towers of Greenloaning, Shielhill South and Huntingtower and, instead of the single phase that had been expected, all three produced signs of at least two and possibly three structural periods. In other words, instead of being built, occupied briefly and then demolished, the towers had needed to be completely rebuilt at least once and possibly twice during their service lives. Moreover, a CFA excavation at the Gask tower of Blackhill Wood soon produced a similar picture and, in each case, the evidence took the form of a replacement of the towers’ main structural posts (fig 3). There was thus suddenly evidence for a more prolonged Flavian occupation, although how prolonged still remains open to question. Much probably depends on how long substantial timber uprights (up to 40cm in diameter) could be expected to last before needing replacement, and this, in turn, depends, at least partly, on what they were made of. For the Romans did sometimes use far from ideal timber in military structures: alder for example, which tends to rot fairly quickly once set into the ground. Environmental analyses from Gask sites have suggested that virtually the only trees in this landscape in Roman times were water-loving species, such as alder and willow, around the rivers, with the rest of the area virtually treeless and devoted to grazing. But the Project’s analysis of wood fragments from the postholes of Roundlaw tower, coupled to earlier evidence from Raith, would suggest that the structural timber actually used was oak and this could have been expected to last for years before needing replacement. 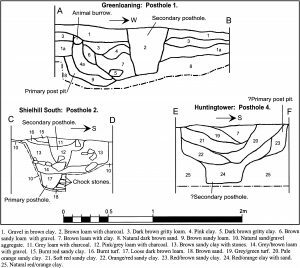 Likewise, a number of sites also showed signs of ditch re-cutting, but not before a considerable depth of silt had formed in the ditch bottoms. Indeed some of the ditches had silted almost back to the original surface before they were re-dug and this again must have taken some time, especially as Glenbank fortlet, had its ditches cut no less than three times. The result was a clash between a historical model which tells us to expect between 1 and 7 years of occupation and archaeological evidence for significantly more. Of the remaining excavated Gask installations, most were studied by 19th and early 20th century methods and were not well enough recorded for phasing to show. Nevertheless, one more tower, Moss Side, does show signs of rebuilding. Furthermore Westerton, the only other tower to have been excavated by modern methods, proved to have two posts in the one post hole studied and, although their relationship remains unclear, this could be an indication of the same process. More interestingly, there is evidence that at least one of the frontier sites was rebuilt as a completely different installation type, for the fortlet of Midgate, when excavated, in 1900, was found to sit so close beside one of the watchtowers that the two sites’ ditches come to within 13m of one another. There was obviously little point in placing lookout points so close together and so these two cannot be contemporary, which means that at some point the Romans replaced a tower with a fortlet here, or vice versa. Unfortunately, the ditches stay just far enough apart that their upcast does not overlap to provide a stratigraphic sequence, and so it has not been possible to show which site came first. There may, however, be another of these double sites, at Raith. One of the normal Gask towers was found on this spot during the construction of a water tank in 1901. But air photography has since revealed a possible fortlet ditch, which instead of sitting next to the tower, as at Midgate, actually surrounds it. Indeed, Raith might actually be a triple site since both installations lie inside a newly discovered Roman temporary camp (fig 4). This site should thus be able to tell us the building sequence, although as yet the Project has been unable to get access to the land. Nevertheless, the very existence of these double sites provides additional evidence for prolonged occupation. The Project has also been able to compare ancient pollen trapped in the turf used in Roman ramparts (which preserves evidence for the immediately pre-Roman landscape) with that from Roman period ditch silts. This has revealed evidence that farming intensified during the occupation, presumably in response to Roman, supply needs, which would probably have been met by some mixture of taxation and purchase. But, as the same pollen evidence also shows that native farming in the area was almost wholly based on stock rearing, this is something that could not have happened overnight. Building stock numbers takes a lot more time than increasing arable cultivation and so again an extended occupation seems to be needed. Things become even more complex when we look beyond the Gask to the forts of Strathmore. These lie north of the Tay and so, on the current chronology, they should only have been in use for perhaps 2 years, but again signs of rebuilding are emerging. For example, A.S.Robertson’s large scale excavations at Cardean during the 1960s and 70s are currently being prepared for publication by B.Hoffmann who has shown that all of the major excavated buildings have evidence for at least one rebuild. Inchtuthil may also be longer lived and more complex than is often thought, for an extra ditch and rampart defence was discovered to the east of the fortress in 1901 (close to the so called “officers compound”) which may represent another phase. This was ignored in the report of Richmond’s post-war excavations, as were two long rectangular buildings which could be associated with this structure. There may even be signs of Roman activity on the site after the fortress was given up, for the 1901 excavation found ovens set into its ditch, whilst Richmond himself found a Roman ditch cutting through one of the demolished tribune’s houses. The ultimate record may go to Cargill, however, where unpublished excavations in the 1970s apparently found up to six phases in at least parts of the fort (G.S.Maxwell, pers comm). 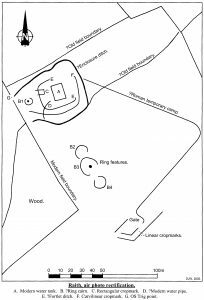 This is anyway rather an odd site because the full-sized auxiliary fort lies only a few hundred yards to the east of a large (c.1 acre) fortlet. The two seem unlikely to be contemporary, as again there would be little point in putting garrisons so close together, and so this second site adds yet another phase and, whilst it might be possible to imagine a fort being remodeled once, soon after construction, seven structural phases (including a change of site type) in two years seems far-fetched in the extreme. In fact, even as far north as Strathmore we seem to have prolonged Flavian occupation and the only available conclusion is that something is wrong with our current historical model. We simply have to have a longer first century occupation than was previously thought possible. But where can we push the present chronology? At first sight the start date of 79, imposed by the “Agricola” seems to be writ in stone, but any assumption that the Romans must have stayed on later than we had thought immediately faces something of a brick wall. Current theory on the end of the occupation rests largely on an analysis of the coins from Scotland by Hobley. Roman 1st century coinage did not, it seems, enter Britain in a steady flow. Instead, new coins were only provided by the central mint when they were needed for some reason, perhaps to top up a government pool usually reliant on the province’s own taxation. There are thus surge years when large numbers of coins arrived, followed by dearth periods (which could last for many years) when new coins were rare. 86 and 87 AD happen to be particular surge years, so much so that it is unusual for a site of any significance occupied during those years not to produce their coins. There was then a pause in the coin supply which lasted until after the Emperor Domitian’s death in 96. The forts of Northern Scotland have produced quite a number of coins of 86, many of which show little or no wear, but none are known with certainty from 87. It seems likely, therefore, that the Romans pulled out of Scotland at some time between late 86 and mid 87. This is fairly hard evidence and it certainly fits well with what we know of the history of the period. For in the mid 80’s AD Rome suffered a series of defeats in the strategically far more important Danube lands, only a week or ten days march from Rome. As a result, troops had to be withdrawn from wherever they could be spared to protect the imperial heartlands. Britain, as a peripheral, and perhaps ultimately expendable province, was an obvious target and permanently lost one full legion (perhaps accompanied by auxiliary units). As a result, the provincial army may no longer have had the manpower to hold the northern conquests safely, and a withdrawal in or around 87 fits perfectly. Moreover, however long the occupation was, we have plentiful evidence that its abandonment was a matter of deliberate Roman policy, rather than the result of at least direct hostile pressure. At the same time, however, it might also have been rather sudden and unexpected by the men on the ground. For there is no evidence, from any of the sites, for the sort of destruction that might have been caused by enemy action. Instead we find a general picture of careful demolition and the elimination, removal or burial of useful material. Yet Midgate fortlet seems to have been abandoned whilst in the process of having its ditch cleaned out: not a particularly long job on a site of this size (c. 24m square) and something that would surely not even have been started had the garrison known that they were about to withdraw. If we cannot push back the end of the occupation (and even if occasional coins of 87 do turn up in the future, other find types cannot be taken beyond about 90), the alternative is the 79 start date. Here, of course, we run straight into the “Agricola” and centuries of scholarship based on it. It had seemed unassailable but is it, in fact, so credible a work? Indeed, to what extent can we trust it at all? The “Agricola” is all too often treated as straightforward biography, or even as history, but in reality it is no such thing and was never meant to be. Tacitus says so. In fact, he had quite a number of personal axes to grind here, ranging from political spin to filial loyalty and personal vanity and is probably best treated with at least a degree of skepticism. Somewhat nebulous doubts over Tacitus’ veracity are hardly new, but his credit was recently given a major blow by tree ring dates for the rampart timbers of the earliest fort at Carlisle. As with Scotland, Tacitus has been interpreted as assigning the conquest of northern England to Agricola and so, not surprisingly, Carlisle (although not mentioned in the text) had always been assumed to have been an Agricolan creation. It thus came as something of a shock that the dendrochronology provided a very firm foundation date of late 72. These were not seasoned timbers, so we cannot argue that they had simply spent several years in storage. Likewise, this installation was a permanent Roman fort and not just a temporary camp that could be safely assigned to some minor unrecorded excursion.. Yet it had been founded five years before Agricola’s tenure of office even began, in the time of his predecessor but one as Governor, Q Petillius Cerialis. Such a serious contradiction of Tacitus’ account forced a complete reexamination of our history of this period and evidence can now be put forward to suggest that Cerialis’ activities may have extended well beyond Carlisle. Moreover, there are Roman literary sources to back this up. For example, Pliny the Elder’s “Natural History” makes a reference to Roman campaigns against the Caledonians within thirty years of the invasion, i.e. by or before 73, whilst the poet Statius refers to Cerialis’ own predecessor, Vettius Bolanus, setting up a rather familiar sounding system of “watch towers and strongholds” in Caledonia. Statius was a poet and his geography may be somewhat uncertain (as indeed was Tacitus’). It might, thus, be argued that to him “Caledonia” may have meant little more than “up north”. But it is interesting that he actually used the term “The Caledonian plain”, which is suggestive of the central belt, whilst the stock description of Scotland was as mountainous. Pliny, however, was a very different animal: a scientist and friend of the Emperor Vespasian, he was a senior Roman official who knew his geography and might be expected to use political language precisely. Under normal circumstances his “within thirty years” might even then be taken as somewhat vague, with a margin for error which might be pushed as far as Tacitus’ AD 79 date for Agricola on the Tay. But Pliny died in August 79, in the same eruption of Mt Vesuvius that destroyed Pompeii and, as the dedication in his book suggests that it was published in 77, there can be no doubt that he was referring to operations before Agricola became governor. Even Pliny’s remark, however, might not be enough to prove permanent occupation, rather than occasional campaigning in Scotland, but archaeology might now be bridging that gap. For, in addition to the structural evidence already discussed, there is now growing support from finds analyses. For example, Ian Caruana has recently pointed out that there is enough pottery from the reigns of Nero and Domitian’s father Vespasian to suggest pre or very early 70’s occupation on sites as far north as the Gask fort of Strageath. Birgitta Hoffmann is currently writing a book length report on the glass found during all excavation and field walking activity at the fort of Newstead and says that she would now be perfectly comfortable with a foundation date in the late 60s. Meanwhile David Shotter has made a reexamination of the coin evidence from Scotland and has revealed a disproportionately large number of Neronian and early Vespasianic coins. Many of these show little wear and so had not been in circulation for long when lost and, statistically, they are now reaching the point where a start date by or before the early 70’s seems at least as likely as the traditional date. The cumulative results of all this activity boil down to something that would have seemed utter heresy just a few years ago. For it is now looking more and more possible that Agricola was not the first Roman Governor to occupy Scotland. The Romans may already have been there when he arrived. The issue is still open to question, but a maximum life span for the occupation of around 15 years (from say 72 to 87) no longer seems unlikely and, at the very least, we need to stop trying to explain away what would otherwise have been perfectly valid archaeological data simply because it conflicts with Tacitus. This is not, of course, to deny the presence of Agricola, for we know from inscriptions and other written sources that he did serve as governor of Britain. Indeed he may well have gained military achievements. But this rewriting of history would solve a number of questions that have puzzled scholars in the past. In particular, Agricola was simply not the sort of person who got the job of Governor of Britain, at least at a time when serious campaigning was contemplated. Britain always remained a somewhat anomalous province for the Roman army because, as an island in an age of unreliable sea transport, it was difficult to reinforce quickly. As a result, it had to be able to stand alone in a crisis and so always had a disproportionately large Roman garrison: in fact the largest of any province in the Empire. This meant that its governorship was one of the most senior available. As a consequence it almost always went to one of the leading generals of the day and this is something which Agricola, at the time of his appointment, most emphatically was not. Normally, a governor of Britain would have already governed at least one other military province and would often have campaigned under his own command. If we take the examples of Agricola’s three predecessors, any one of which might have been the real invader of Scotland, Vettius Bolanus, (Governor 69 – 71) had campaigned in Armenia. Cerialis (Governor 71 – 74), was a relative of the Emperor and possibly the most able general of his day, who had come to Britain shortly after putting down a dangerous revolt in the Rhineland. Meanwhile, Julius Frontinus, (Governor 74 – 77), wrote books on military stratagems. And what had Agricola done? Tacitus gives us quite a catalogue but, although it is obviously meant to seem impressive, it never quite succeeds. He had performed two brief periods of military service, as part of the normal senatorial career, which included a term as commander of the 20th legion in Britain (ironically under Cerialis). But his only experience as a provincial governor was in Gallia Aquitania, one of the few Roman provinces with no army presence whatever. Otherwise, he had had a career of wall to wall administration. Like most Senators, he was probably an practiced politician, lawyer and bureaucrat, but although he had enough military experience to know how the army worked, and had seen some active service, he was by no means a military figure. Yet he was then appointed to govern Britain, one of the most senior commands in the Empire. It seems like madness but, in fact, there are plentiful precedents and, timed well, it could be a perfectly sensible move. What normally happened is that once (and only once) a major campaigning sequence was over and any new territory was pacified, exactly such a figure would be sent in to create the machinery of Roman provincial government: a tax system, a judicial system, proper logistical arrangements for the army and so on. Of course occasionally Rome miscalculated, the most famous example being Varus, who was sent into Germany as just such an administrator after the Province’s supposed conquest and ended up loosing his life, his army and the Province itself in the course of a native revolt, in 9 AD. For the most part, however, this arrangement worked well and it is noteworthy that Tacitus stresses Agricola’s work in Romanisation and taxation matters. Of course there may still have been trouble and there may even have been a battle of Mons Graupius, although in reality it may actually have been little more than a skirmish, but fighting was probably not the real reason Agricola was here. It seems more likely that he was appointed primarily to put conquests actually gained by his predecessors onto a proper administrative footing and that what military ability he may have had was merely a useful safety feature. The writer is grateful to Mr I.D.Caruana, Dr B.Hoffmann, Mr G.S.Maxwell, Dr S.Ramsay and Prof D.C.A. Shotter for their help and suggestions during the research for this paper. The Roman Gask Project is sponsored by Perth & Kinross Heritage Trust. Caruana, I D 1997 ‘Maryport and the Flavian Conquest of North Britain’, in Wilson, R J A (ed) Roman Maryport and its Setting, Nottingham 40 -51. 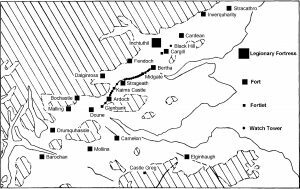 Glendinning, B and Dunwell, A 2000, ‘Excavations of the Gask Frontier Tower and Temporary Camp at Blackhill Wood, Ardoch, Perth & Kinross’, Britannia, 31, 255-290. Körtüm, K 1998 ‘Zur Datierung der römischen Militäranlagen im obergermanisch-rätischen Limes gebiet, Chronologische Untersuchungen anhand der Münzfunde’, Saalburg Jahrbuch, 49, 5-65. Pliny the Elder, Naturalis Historia, Loeb edition, Trans: H Rackham. Shotter, DCA 2000 ‘Petillius Cerialis in Northern Britain’. Northern History, 36:2, 189-198. Woolliscroft, DJ 2002 The Roman Frontier on the Gask Ridge, Perth & Kinross, BAR (British Series), 335.